Google brought two of its flagship productivity services to Apple's App Store on Wednesday, Google Docs and Google Sheets. The company released native apps for the services as free hybrid apps designed for iPhone and iPad, and in a blog post announcing the move, Google said its presentation service, Slides, is "coming soon." Google Docs and Google Sheets have both been available through a browser on iOS, but the app versions of the services arrived just in time to go toe-to-toe with Mircosoft's Office apps for iPad. Google released them simultaneously on Google Play for Android, too. Create, edit & collaborate with others on documents from your iPod, iPhone, or iPad with the free Google Docs app. Create new documents or open and edit any that you started on the web or another device. 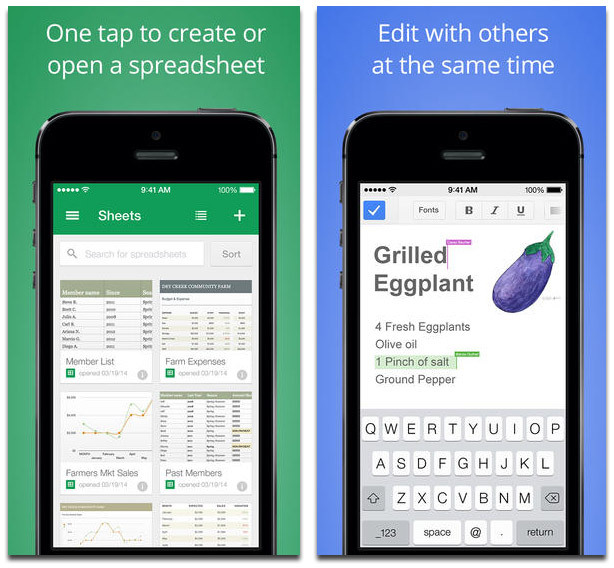 Create, edit & collaborate with others on spreadsheets from your iPod, iPhone, or iPad with the free Google Sheets app. Create new spreadsheets or open and edit any that you started on the web or another device. As noted above, both apps are free, both are hybrid apps for iPhone and iPad, and they're available now.